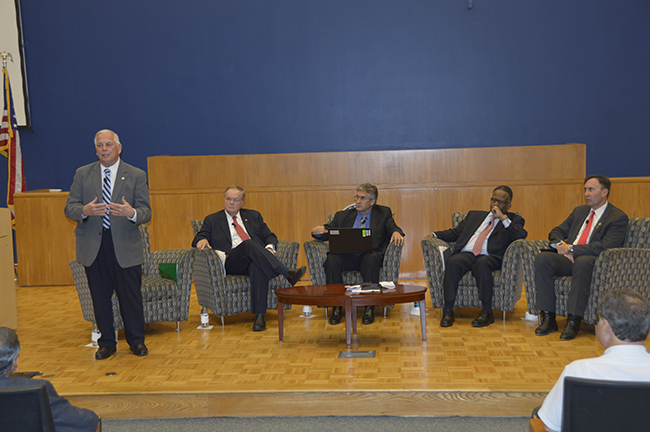 Rep. Gene Green '77, left, Wayne Christian of the Railroad Commission of Texas, UH professor Jim Granato, H. Russell Frisby Jr. of Stinson Leonard Street and Rep. Pete Olson, right, respond to audience questions on energy policy in Krost Hall at the University of Houston Law Center. April 11, 2017 - A discussion that analyzed the implications of President Donald Trump's administration's emerging energy policies and their potential impact on the industry, economy, and the future of the planet brought several U.S. congressmen to the University of Houston Law Center. "The Future of Energy Policy," was the final symposium of the UH Energy Symposium Series, and was recently held in Krost Hall. The opening speaker was Wayne Christian, a commissioner on the Railroad Commission of Texas. Christian was elected to the agency in November 2016. Christian represented District 9 in the Texas House of Representatives from 1997-2005 and again from 2007-2013. Christian said that despite the environmental reputation of coal power, Texans remain dependent on it as a significant source of energy across the state. "Coal is considered the dirtiest of the dirty, but coal in the state of Texas is one-third of our electric grid," Christian said. "Had we stopped production of coal, every family's electric bill would have gone up by over $1,000 per year, and you would have seen over 6,500 jobs in northeast Texas alone go away. People need to understand that coal is very much a great part of our economy and the system of power generation in Texas. H. Russell Frisby Jr., a partner at Stinson Leonard Street, focuses on regulatory and corporate matters affecting communications, energy and technology. He said that markets and technology, not politicians, will have a greater impact on the future of energy policy and that electric vehicles, renewable energy and the emergence of microgrids will drive change in the industry. "Washington may not be as important as we think it is," he said. "There are some fundamental changes particularly in the electric industry and oil and gas industry which are going to move forward regardless of who's in office or what the policy is." Rep. Gene Green, a 1977 Law Center alumnus, was the third speaker Green was elected to the Congress from the 29thCongressional District in 1992 after 20 years in the Texas legislature. He is the ranking member for the subcommittee on health and also serves on the subcommittees on energy, environment and digital commerce and consumer protection. Green highlighted the versatility of Texas' power sources, including wind power, and stressed the significance of planning for the future. "The future of energy policy is made by thinking about tomorrow and planning for 2050 and beyond," he said. "The foundation and the technology will benefit the United States economy and the environment in 2050 will be created today." Rep. Pete Olson was the final speaker. Olson was elected in 2008. He serves as vice chair of the energy and power subcommittee and is a member of the communications and technology subcommittee. He also serves on the environment subcommittee and co-chairs the Congressional Refinery Caucus and Corrosion Caucus. He said he supports the use of clean energy sources, but that they cannot be the sole energy supplier. "Like Gene mentioned, I'm about all of the above," Olson said. "I love renewables but they have to be supported by the market. Texas is No. 1 in wind production in America, but the wind is not always blowing. The sun is not always shining. You need backup sources like coal power, natural gas power, nuclear power, geothermal energy. Whatever the market supports, I support. A question and answer session followed Olson's remarks. Jim Granato, executive director of the University of Houston's Hobby School of Public Affairs, served as moderator. Closing remarks were delivered by Law Center Research Assistant Professor Julian Cardenas Garcia. Click here to watch "The Future of Energy Policy."